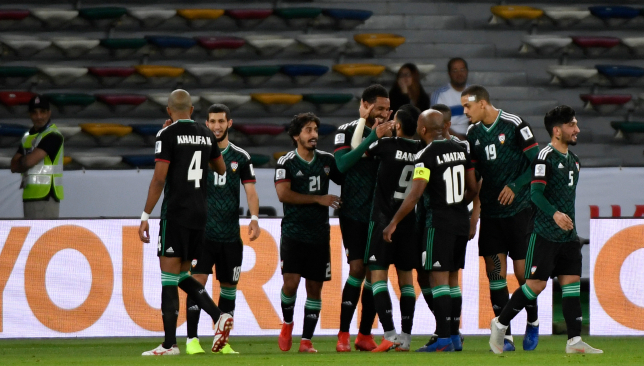 Substitute Ahmed Khalil was the saviour from the penalty spot, once again, for hosts the UAE when his 102nd-minute effort earned a tense 3-2 round-of-16 win against Asian Cup debutants Kyrgyzstan, who struck the woodwork three times. Khamis Esmail headed the Whites in front early on from a corner at a chilly Zayed Sports City. But Mirlan Murzaev soon profited from poor tracking by the same player and slotted home. Wasteful Ali Mabkhout then converted a one-on-one past the hour mark. But a late twist came in the 92nd minute through substitute Tursunali Rustamov’s header from a corner. Just before the break in extra time, Mabkhout was pulled down by Bekzhan Sagynbaev. Just like the opening 1-1 draw with Bahrain, Khalil, critically, did the business from 12 yards. This did not stop hearts being in mouths when Rustamov smashed a shot onto the crossbar past 120 minutes. Holders Australia now await in Friday’s last-eight tie. Khalil’s routine rescue act: Whites head coach Alberto Zaccheroni has much to thank 2015 AFC Player of the Year Ahmed Khalil for. Middling displays against Bahrain and Kyrgyzstan have been salvaged by the 27-year-old from 12 yards. But the spirit on show to get them out of that situation will provide some comfort ahead of meeting the Socceroos. Shaping up: On paper, Kyrgyzstan’s 3-5-1-1 formation appeared too deferential. But its utilisation was not conservative. Captain Valery Kichin was arguably their most-adventurous player from third centre-back/right wing-back. Defensive worries: It’s alarming for the UAE that a greater number of defensive players didn’t equate to solidarity. A failure to track in the 1-1 Group A draw with Thailand was repeated on Monday night. Similarly, Bahrain’s chaotic goal in the opener – also a 1-1 draw – from a cross bore hallmarks of Kyrgyzstan’s leveller at 2-2. Frustrations and regrets: Small details cost Kyrgyzstan the most-famous football result in their 27-year history. Sagynbaev’s tug was unnecessary, while hitting the woodwork so often ladles on more frustration. It condemned this impressive team made from domestic and naturalised players. Kyrgyzstan have never played in an Asian Cup before and are ranked 91st by FIFA, 12 places below the UAE. If you looked at Zaccheroni’s team sheet, however, you’d have thought the Whites were playing tournament favourites Iran or South Korea. A trio of defensive midfielders – Esmail, Ali Salmeen and Amer Abdulrahman – clogged up play in a narrow 4-3-2-1. Winger Ismail Al Hammadi was thrown on in the 62nd minute and then the second swiftly followed. 14th min GOAL: Matar swings in a corner. Khalifa Mubarak rises highest and flicks it onto Esmail to head home. 26th min GOAL: From hero to zero. Esmail doesn’t track the runner, allowing Murzaev to round Essa and slide in on the angle. 46th min CHANCE: Al Ahbabi overlaps and sends in a beautiful cross. Mabkhout then somehow heads wide from four yards. 52nd min WOODWORK: An over-hit cross from skipper Kichin rattles the crossbar. 64th min GOAL: Amer Abdulrahman picks out Mabkhout, played onside by Mustafa Iusupov who’s been outmuscled by Al Hammadi. He then tucks his finish inside the far post. 90’+2 min GOAL: ZSC is stunned into silence as Anton Zemlianukhin swings in a corner that fellow substitute Rustamov heads home, via Mohamed Ahmed. 102nd min GOAL: Mabkhout is bundled over by Sagynbaev. Khalil’s powerful effort skims in via goalkeeper Kutman Kadyrbekov’s ankles. Relief. 106th min WOODWORK: UAE fail to deal with a long throw-in and Bakhtiyar Duyshobekov heads onto the far post. 120’+1 min WOODWORK: Rustamov steadies himself inside the box, but fires a rocket onto the crossbar. The sense of a team playing well below its collective potential remains. Better will be required in the remainder of their knockout run. Australia will not be scared. Kyrgyzstan gave it their all at ZSC and, eventually, came up short against a stronger opponent. A first Asian Cup experience ending in the knockouts is an achievement to cherish and build on. 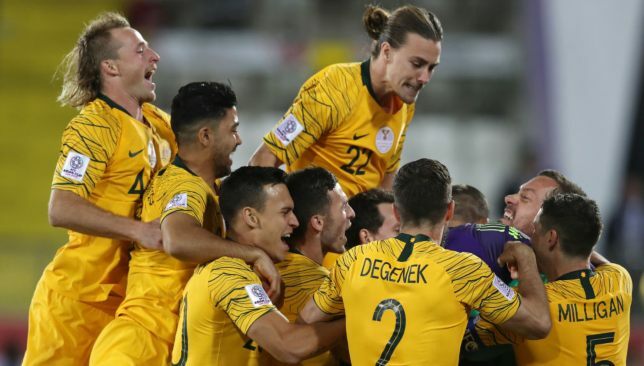 Australia were made to work hard against Uzbekistan for their spot in the final eight at the Asian Cup in the UAE. A closely contested encounter was tied at 0-0 after extra-time in Al Ain on Monday before the defending champions held their nerve in the penalty shootout. Brighton custodian Mat Ryan grabbed the headlines with two excellent saves to deny second half Uzbeki substitutes Azizbek Turgunboev and Marat Bikmaev from 12 yards out. A 4-2 shootout victory extends Australia’s title defence into the quarter-finals. Australia met Uzbekistan on three occasions prior to Monday’s encounter and were victorious each time. In fact, they trounced them 6-0 in their last Asian Cup clash, a 2011 semi-final. However, it’s safe to say the defending champions met their match when confronted by the current Uzbek contingent at Khalifa bin Zayed Stadium. Despite the reputation of the Socceroos, they haven’t been wholly impressive in the UAE, even losing their opener to Jordan, while Uzbekistan have been one of the tournament’s more exciting outfits. You could even argue that the White Wolves were the slightly more fancied team ahead of kick-off and they played like it during the first half. Australia monopolised possession in spells but overall, play evened out. They were compact in their 4-4-2 shape and in the first half were far more creative on the ball than their counterparts. Australia weren’t afforded a clear sight of goal in the opening 45 and were kept at bay in the second period thanks to the organisation of Hector Cuper’s troops who posed a significant attacking threat of their own. At half-time it was Uzbekistan who seemed the more likely to score and win the game but Australia proved their mettle in the second, rallying to dominate proceedings and test their opponents’ resistance. They took control of possession again but this time, created several opportunities in front of goal and forced Ignatiy Nesterov into a couple of fine saves. The Socceroos were more positive on the ball and took risks, running at the Uzbeki defence and forcing them to commit to challenges. They haven’t always shown that side of their game during this tournament but proved that they can turn it on when they need to. Holding their nerve in the shootout was further evidence of their strong mentality with Ryan epitomising that between the sticks. 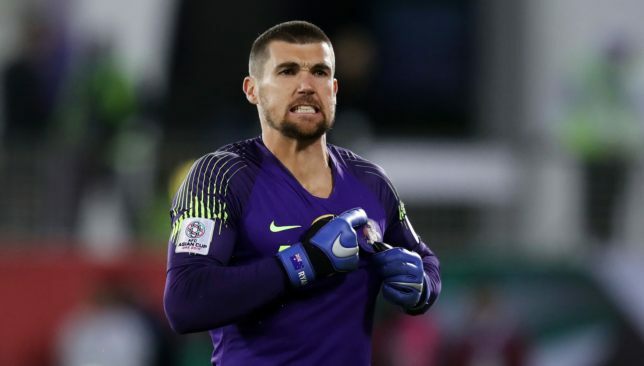 Mat Ryan shone for the Aussies. Tom Rogic knew 20 minutes into the game that he would miss the quarter-final should Australia make it through but that didn’t stop him from leading his side’s onslaught. The Celtic attacking midfielder picked up a booking for a foul on Jaloliddin Masharipov but was crucial to Australia’s play in the second half. His driving runs from midfield helped carve out openings on numerous occasions and Jamie Maclaren should hve scored when he played him in 20 minutes from time before he went close with a shot from range himself. Australia will no doubt miss his attacking influence in the quarter-finals but can take solace in Mathew Leckie’s return; he looked sharp off the bench. 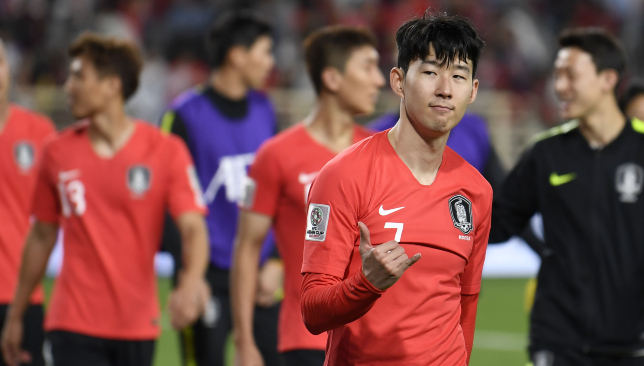 South Korea will hope that Son Heung-min’s instant impact at Asian Cup 2019 will continue when they meet underdogs Bahrain in the round of 16. In Son’s absence, 28 shots had generated 1-0 wins for Korea against the Philippines and Kyrgyzstan. After only one day’s full training, he inspired Korea to double their tournament’s goal tally in the 2-0 win against China when Group C finished. Son’s cutting edge shouldn’t be vital against Bahrain. They are ranked 60 places lower by FIFA in 113th. Head coach Paulo Bento will, though, want to see signs that the late addition’s presence sparks an uplift from team-mates. Holsten Kiel midfielder Lee Jae-sung should be pushing for a start now a toe knock has reportedly been overcome. Bahrain have experienced mixed results to date when combating the tournament’s elite performers. The lethal pair of Khalfan Mubarak and Ali Mabkhout were kept deathly quiet in the opening 1-1 draw against hosts the UAE. Thailand’s J1 League star Chanathip Songkrasin then got the only goal when they met Thailand. In the pivotal last Group A meeting with India, head coach Miroslav Soukup threw on strikers from the bench and was rewarded with Jamal Rashid’s 91st-minute penalty. Such boldness will not be witnessed in Dubai. A likely 4-2-3-1 formation will be utilised to constrict space, with anchors Komail Al Aswad and Abdulwahab Al Safi keeping an eye on Son. Only two goals have been conceded to date, meaning they could frustrate their celebrated opponents. Experienced Newcastle midfielder Ki Sung-yeung has officially departed after only 58 minutes of action, courtesy of a hamstring knock. This has seen Bento, regrettably, wave goodbye to a player with more than 100 caps. Watch out for Hwang In-beom in his absence. The 22-year-old plays in K League 2 with Daejeon Citizen, but he’s impressed in the UAE. Such is the enviable depth of South Korean football.